Misiones del Cabo Hotel and Beach Resort is built into a cliff just above a sandy beach and the crashing waves. One and two bedroom condo suites with full kitchens, dining areas, air-conditioning and large private balconies overlooking the pool, the ocean and the famous "Lands End" are available for rent directly from the resort or from individual private owners. 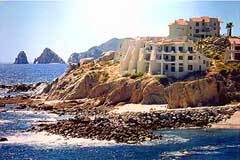 An architectural wonder, the resort features a swimming pool, cascading waterfalls and wading pools surrounding such amenities as a swim-up Palapa Bar and Da Giorgio II Restaurant - one of Cabo's finest. Tennis courts, a mini market, and a laundry service are also on site. Two beaches below the resort offer swimming and snorkeling opportunities. Villa La Estancia offers the resort amenities you'd expect; such as a full-service spa, fine-dining, private tennis courts, and room service. This is your private piece of paradise in Cabo San Lucas.